The EntreTech NYC immersion program at the School of Information Studies (iSchool) is now accepting applications for the May 2017 trip. 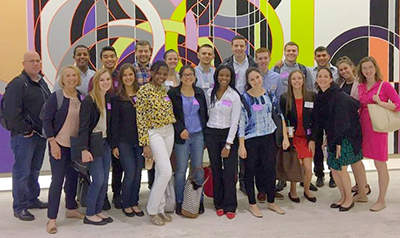 A signature immersion program at the iSchool, Entretech NYC is designed to give students a firsthand look at the companies, entrepreneurs, venture capitalists and way of life (both personal and professional) in Manhattan. The program is open to students from all majors, schools and colleges at Syracuse University, and all degree programs. Students must enroll in a course for three undergraduate or graduate credits. The 2017 trip will take place from May 14-19, the first week of MayMester. Student participants will immerse themselves in New York City’s digital landscape for a week. They will visit and interact with companies, alumni and investors across Manhattan, shadowing IT personnel and entrepreneurs in information-based companies like Google, FourSquare, Gilt Groupe, Kickstarter, Quirky, Night Agency, Brand Yourself, HuffPost Live, Arkadium and others. Entretech NYC is a competitive program with limited space. To be considered for admission, students should have, at the time of application, a cumulative GPA of at least 3.00 on a 4.00 scale. Admissions decisions are based on a full review of the application file, including a transcript, resume, personal statement, video and any disciplinary records. Applications are due by 11:59 p.m. on Jan. 31. More information, including program costs and a link to the application, is available on the EntreTech NYC website.